It's the year 1993. I'm co-producing at top notch recording facility Union studios in Munich. During a break, I'm checking out the Yamaha C series grand piano in the wonderful large recording room of studio 2 and breathe the aura of the acts that recorded here - Tears For Fears, Supertramp, Deep Purple, Queen, and many more. I decide to sample this venerable instrument that definitely has taken a beating, but sounds so clear and bright to cut through any mix. I use the standard sampling method of that era and record every third key at two velocities, but I never manage to finish the project. Years go by. I have kind of forgotten about this recording as I long since owned piano libraries that use obscene amounts of storage space and God knows how many velocity layers. Some sound great, others don't despite the lavish use of resources. One day, I purchase an editor that finally makes editing samples comfortable. In my archives, I stumble upon these piano samples again. Building a quick test instrument takes only minutes of editing. Yes, I wish I'd had the foresight to record every key and more velocity layers, but I'm surprised how well the character of the instrument is preserved even at this miniscule usage of resources by today's standards. The total sample size clocks in at just under 70 Mb. No wonder I never finished the project back then - in 1993, even the top samplers max out at 32 Mb - this would have busted my fully loaded rig and sentenced me to several weeks of solitary confinement while attempting to find dozens of perfect loop points! Fortunately, now I don't have to loop them anymore. There is a natural decay on the samples, not into complete silence, but pretty close. And who knows... had I attempted to record all the details, people coming in for the session might have interrupted me, and I would be sitting on a useless half of a sampled piano! 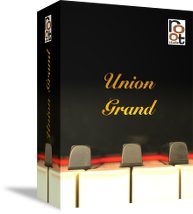 So, 20+ years later, I finally fine tuned the parameters and the Union Grand is now my go-to piano for all things pop when everything is at least mezzoforte. There is a very special, delicate stereo imaging in these samples. The beautiful, now defunct, recording room of studio 2 left its mark. My bow to the legacy of the studio shall be the reference in the library name. Image of Union Studio courtesy of Andy Eschenwecker.